New England living standards were higher than anyplace else in the world during much of the 17th and 18th centuries. 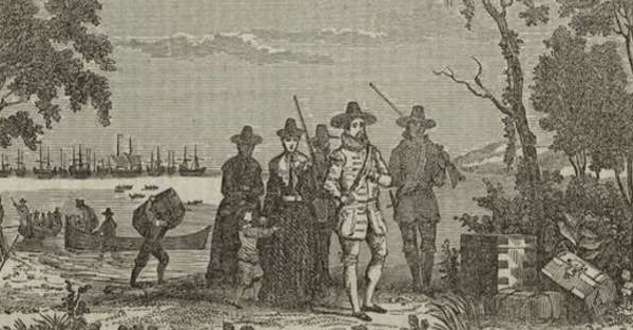 John Winthrop arrives to establish a city upon a hill and New England living standards. By 1700, just 70 years after the Puritans’ Great Migration began, colonial Americans had 38 percent more purchasing power than their British brothers and sisters. By the American Revolution, they had half again as much buying power as Britons, according to economists Peter Lindert and Jeffrey Williamson. Not coincidentally, colonial America was the most egalitarian society on the planet, according to Lindert and Williamson. And, among the colonies, New England spread the wealth more widely. By 1790, the middle 40 percent of the population got 52.5 percent of total income. Why were New England living standards so high? It was probably a combination of bountiful land and sea, and the Puritan legacy of hard work, public investment and fairness. Anyone who has visited a colonial house museum (and who hasn’t?) realizes New England living standards weren’t all that lavish. John Adams’ farm, for example, was a far cry from Versailles. But by the time of the Revolution, many, many New Englanders lived comfortably. In 1776, an anonymous writer described the typical New England farmer, who owned his own land. Their farms yield food--much of cloathing--most of the articles of building--with surplus sufficient to buy such foreign luxuries as are necessary to make life pass comfortably; there is very little elegance among them, but more of necessaries. Certainly the region’s bounty contributed to New England living standards. The land yielded plenty of food and wood, the main source of energy. The sea yielded abundant fish. The low population density prevented disease from spreading as much as it did in Europe, which led to strong population growth. One indication of the colonies’ higher living standards is height. Taller average heights generally suggest better health and a more plentiful diet. In 1770, the average colonial soldier stood 5’8”, two inches taller than his British counterpart. No one could accuse the Puritans of being egalitarian. They believed every person had a proper station in the hierarchy, and instilled a rigid dress code to indicate one’s social status. Winthrop also believed previous English settlements failed because of rapacious merchants and inexperienced people in government. Fortunately for New England, the Puritan leaders came from the ranks of the lower nobility. As a result, they had more of a clue about running things than, say, Jamestown in the Virginia colony. That expertise contributed to higher New England living standards. Winthrop offered economic incentives for mills, dams, saltworks, ironworks and mines. His son, who became governor of Connecticut, followed in his father’s footsteps. 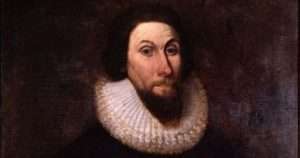 John Winthrop the Younger famously rode from Boston through the wilderness to New London, where he founded an ironworks. In most Puritan towns, the town bull could service all cows and they could graze on the town common. People could cut wood from the common woodlot. To promote fishing, Winthrop exempted fishermen from military service, and Massachusetts town officials could draft laborers for public works projects like roads and bridges. They could also draft merchants to harvest crops so they didn’t rot in the field. New England Puritans viewed profiteering as a sin and a crime. At least one merchant bore the brunt of that belief. Robert Keayne, a wealthy Boston merchant, was fined and humiliated for price gouging. Puritans believed in a ‘just price’ for commodities and for wages, but had a hard time figuring out just what it was. Wage and price controls came and went for decades in both Massachusetts and Connecticut. In 1641, for example, Connecticut’s General Court passed wage controls. Skilled craftsmen – carpenters, masons, coopers, smiths and wheelwrights -- could not accept more than 20 pence a day from March 10 through October 11. Other handicraft workers could not take more than 18 pence per day for the first half of the year, nor more than 12 pence during the second half. The law lasted about a decade before Connecticut abandoned it. Massachusetts tried wage and price controls during the first half of the 1630s, then gave up and left it to the towns. But even without laws on the books, New Englanders retained a strong sense of fair play in the marketplace. During the American Revolution, women rioted against merchants who overcharged for food during shortages. 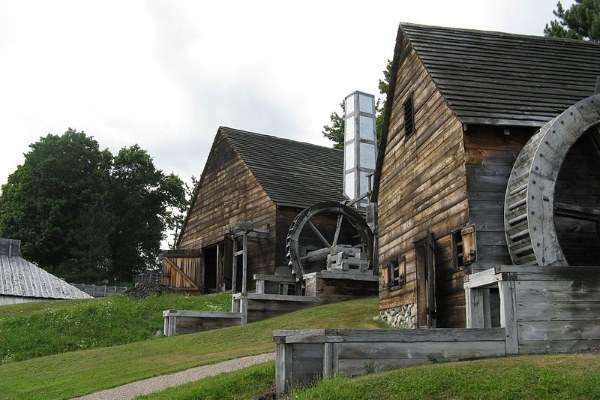 Wars, including the American Revolution, interrupted New Englanders’ economic well-being. And living standards fell during the 19th century until after the Civil War. But overall, one could certainly argue that a belief in economic justice led to high New England living standards during the colonial era. Historic cemeteries in Portland, Maine.